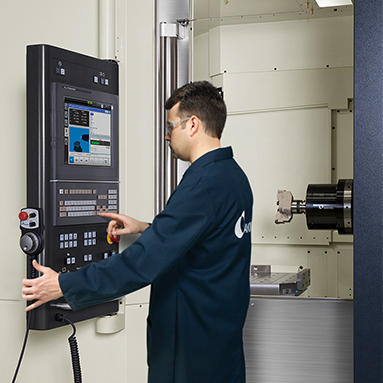 What happens when you take top-performing horizontal machining centers and make enhancements? You have the opportunity to expand upon their best features for unmatched productivity and performance. 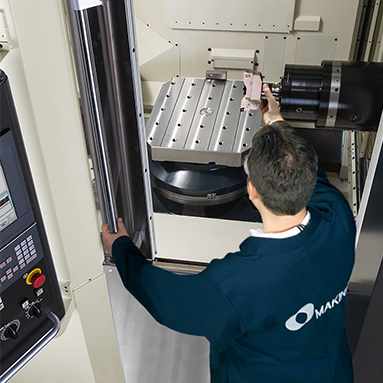 That’s exactly what has been done with the newly updated Makino a51nx and a61nx horizontal machining centers. The familiar highly rigid casting and axis design of these industry leading machines remains in the bed, column, table, linear guides and ball screws. 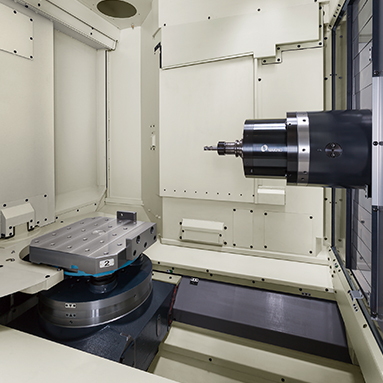 What has been improved are the machines’ expanding list of technology features, including increased spindle torque, innovative tool monitoring and advanced motion controls. These and other productivity improvements such as the new Professional 6 control and better ergonomics have been added to improve productivity and reliability at no additional cost. 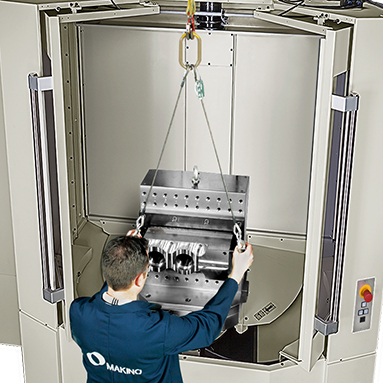 “When it comes to uptime, reliability and productivity, aerospace manufacturers won’t find a more robust set of horizontal machining centers,” says David Ward, horizontal product line manager at Makino. Industry-leading spindle reliability continues with the new a51nx and a61nx models, featuring a standard 14,000-rpm (30kW) spindle that has been upgraded to deliver 303Nm of duty rated torque. This enables the machines to accelerate and decelerate from full RPM in 17 percent less time. When compared to previous models, the additional torque reduces rigid tapping time by 20 to 25 percent per hole. Large diameter angular contact bearings ensure the highest level of rigidity for a variety applications and processes. 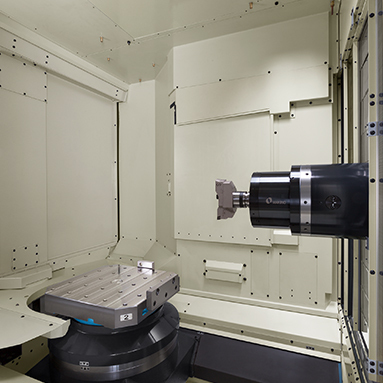 An optional 24,000-rpm (80/60 kW) spindle is available on the a61nx model for extremely high metal removal rates in aluminum structural aerospace parts. A new 20,000-rpm (30/18 kW) spindle with direct inject air-oil lubrication is also available, providing improved reliability and greater power for enhanced productivity. Several enhancements have been made to reduce non-cut time on the new a51nx and a61nx machines. A vision-type broken-tool sensor (Vision B.T.S.) comes standard, supporting unattended operation by quickly validating the condition of cutting tools after each tool change. By creating a silhouette of the cutting tools, Vision B.T.S. is also able to detect the length, size and approximate weight of the tool. This information can then be applied to automatically set the tool change speed to the appropriate setting (fast, medium or slow). The Vision BTS system has fewer moving parts and requires no physical contact with the cutting tool, allowing for enhanced long-term reliability and less risk of chipping delicate tool materials, such as polycrystalline diamond (PCD). 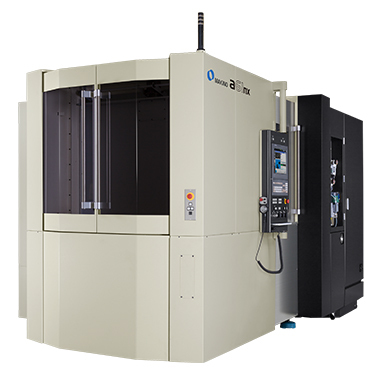 Inertia active control (IAC) technology has also been expanded on the updated a51nx and a61nx machines to provide additional efficiency. In addition to optimizing positioning motion of the rotational B-axis, IAC technology is now able to improve acceleration and deceleration rates along the Z-axis. This is important for improving productivity because the Z-axis moves more than any other axis during the cutting process. IAC has also been added to the rotation of the ring-type tool magazine. Each time tools are loaded into the magazine, IAC quickly evaluates the total weight held in the ring. Acceleration of the ring rotation is then adjusted to match the total load. Faster ring acceleration means reduced tool magazine seek times. The Professional 6 (Pro6) control on the updated machines is designed to move operators fluidly through machine setup, empower them with easily accessible information and protect them with enhanced safety. Cycle-time saving and dynamic-control capabilities have been added to the new control’s GI functions to help lower costs per part. Streamlined operation – The screen layout matches the operator’s process flow from setup to production. Operator assistance – Guidance functions, parameters, code and manual search function are available on screen to provide assistance when and where it’s needed. Fully equipped – Thousands of dollars of options are now standard on Pro6, making it ready for any job. Productivity focus – New functions raise the standard for machine control, including its GI, which provides 2-D corner control and optimized canned cycle indexing. Enhanced safety – Dual Check Safety (DCS), 3-D graphic viewer, maintenance screens and easy access to machine information are included. Two forms of advanced motion-control GI are included with the Professional 6 control. GI Drilling is a unique G-code drilling cycle that allows the spindle and tool to arc from hole to hole instead of following a square path. This simple change reduces non-cut time by as much as 15% on common hole pattern drilling. 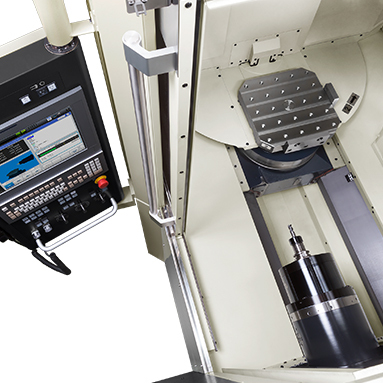 GI Milling, the second new advanced motion-control, is designed to improve performance in 2-D milling. GI Milling allows the user to define a corner rounding tolerance on each milling path. Even a small tolerance allows the machine to quickly flow through the cut path, completing milling paths in less time. On complex 2-D paths, testing has shown cut time reductions as high as 35%. Not every tool will use these new features but on typical production components the new advanced motion control GI is reducing overall cycle time by 3 to 8 percent. This provides substantial cost reductions in both high-volume and low-volume production environments. In a high volume production environment, that degree of cycle time savings can reduce the number of spindles required. Reduced cycle times open up machine availability enabling lower volume manufactures to take on more work. The exterior of the machines have evolved in an effort to make maintaining the machine easier for the operator. The new L-shaped door, when open, allows more light to enter the machine and prevents fluid from dripping onto the operator during inspection and maintenance. The wide opening on the Pallet Loading Station (PLS) doors provides easy access for loading of fixtures and large workpieces. This type of accessibility is crucial for part loading and unloading in robot automated environments. Chip and coolant management has been improved with the addition of a standard hydro-cyclonic filtration system. This system cleans coolant down to a 20μm level, extending the maintenance life of the coolant.